Click here to download and print this list of foods toxic to dogs for yourself! Place it in on your refrigerator or near your dog's food. There are four to a page - cut one out for yourself and share the others with your dog friends. This website contains ratings and reviews of hundreds of different dog foods. It is a great source for learning about dog food, and deciding which food is right for your dog. This is a publication which contains tips and guidelines for natural dog care and training. Each year they put out a list of the best dry and wet dog foods available. It is an invaluable resource for any dog owner. If your boxer has gas (and he will!) add a spoonful of plain, nonfat yogurt to his food every day. It will help. If your boxer has loose stools, add a spoonful of plain canned pumpkin (not pumpkin pie filling!) to his food to help firm things up. Feeding your dog a high quality diet is one of the most important things you can do to ensure that they live a long and healthy life. There are a lot of choices out there when it comes to dog food. It is important to do your research, because not all dog food is equal, and there are a lot of bad foods out there. 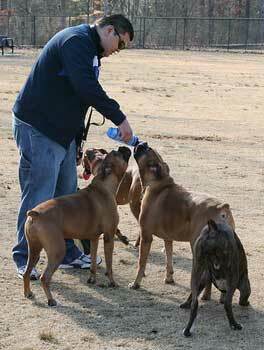 You have three main choices when it comes to feeding your boxer. You can feed a raw diet, homecook for your boxer, or feed a commercial diet. If you decide to rawfeed or homecook for your dog, please do research on the method that you select to ensure that your boxer is receiving everything that they need for a complete and balanced diet. Feeding a commercial diet is the most common choice. "What food should I feed my dog?" is such a common question. Unfortunately, there is no good answer. Every dog is different, and there is no perfect food that works for all dogs. You will have to do some research, and try some different brands before you find the food that is right for your dog. Most quality dog foods are not sold in supermarkets, or even in large chain pet stores (although they do usually carry at least one or two premium brands). The best place to shop for dog food is at your local feed store, or pet supply shop. And don't worry. The premium brands usually work out to be the same price, or even cheaper than the big name brands! If you decide to feed your boxer a commercial kibble, it is important that you understand how to read and interpret ingredient labels so that you know how to choose a quality food. Ingredients are listed by weight, similar to the ingredients on human food. Therefore the first ingredients are what make up the majority of the food. Dogs are carnivores, so you want the first ingredients to be some form of meat. Beware the common practice of "Ingredient Splitting" This is where one ingredient is broken up and listed separately in the list, so that it appears like there is less of it in the food. For example, if the ingredients list reads "Chicken meal, Rice, Rice Bran" then there is a good chance that there is actually more rice in the food than chicken, because rice and rice bran are both rice. Avoid foods that contain wheat, corn and soy in any form. These ingredients are fillers that provide little to no nutritional value for your dog. They are used because they are cheap and easy for the dog food company to obtain. Wheat and corn are two of the biggest causes of food allergies. Because boxers as a breed are prone to food allergies, it is especially important for you to feed your boxer a food that doesn't contain these ingredients. As you start reading dog food labels, you will see meat ingredients listed in three different ways. Meat, Meat by-products and Meat meal. By-products are generally a very low quality ingredient. They are all of the bits of the animal that are leftover after processing for human consumption. Avoid foods that contain by-products. Meat Meal is actually the best term to see. It is the same as Meat, but with the water removed. Because the water must be removed in order to make kibble, if you see an ingredient listed as just meat, it should actually be further down in the ingredient list than it is. Another important thing to look for is that all meat ingredients should be identified as coming from a specific animal. For example, you want to see chicken meal, not poultry meal, or meat meal. If the specific animal is not identified it is because the ingredient is of such low quality that the producer either could not, or did not want to identify what animal the ingredient came from. Certain known carcinogens are allowed to be used in dog food. These ingredients include BHA and BHT (common preservatives) and ethoxyquin (commonly found in fish). Avoid foods that contain BHA and BHT, or foods that contain fish that is not specified as ethoxyquin free. Many of the puppy foods available today are largely marketing gimmicks. Your puppy has the same basic nutritional needs as that of a grown dog, so as long as you're feeding a high quality dog food, and feeding the right amount according to the puppy guidelines printed on the bag, then your puppy should be getting everything that he or she needs. One important thing to look at is the amount of protein in the food. Your puppy needs a minimum of 22% protein, but not more than 26%. Foods with protein levels higher than 26% are only appropriate for dogs over 18 months of age. Higher protein levels can cause your boxers musculoskeletal system to develop too quickly, which can cause bone and joint problems later in life. Remember that treats are just as much a part of your dogs diet as the food they eat every day. If you are purchasing dog biscuits, make sure to review the ingredient list using the same guidelines explained above. There are actually a lot of human foods you can use as treats that are very healthy for dogs. Raw fruits and veggies, cheese, boiled chicken and natural peanut butter are all good. A great treat to keep your dog occupied for a while is a Kong toy (it is a red rubber cone shaped toy that is hollow and can be stuffed with treats) filled with any combination of peanut butter, dog food, plain yogurt and banana. Freeze it, and give it to your boxer whenever you want an hour of peace. They will sit quietly with it till they have licked it clean.